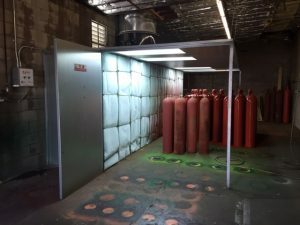 Industrial ETL-Listed Open-Faced Booth: Painting Tanks! Cramer Decker is a global leader in the development and delivery of innovative life support technologies and gas management solutions, according to their web site. They ordered our open face booth for their facilities in California. 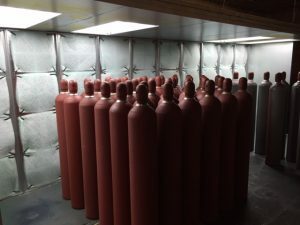 They use it in the industrial application of coating tanks. 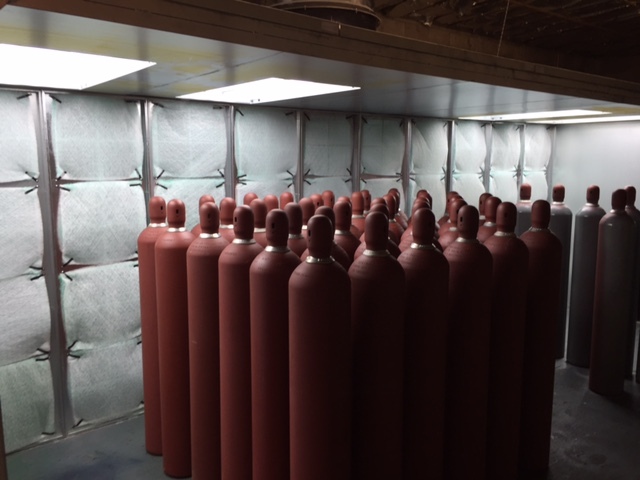 They ship the tanks out empty, to be eventually filled by their customers with gases like oxygen, nitrogen or argon. They have an ETL-certified 20′ wide open-faced booth (OFB-20). With the ETL-listing the booth also received the Standard Tools control panel for operating the lights and fan. 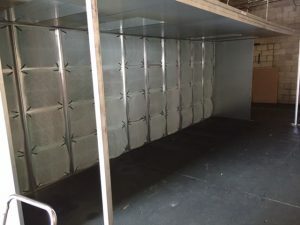 The open-faced design draws air into the booth through the open front, which is then exhausted through the back wall filters. The open front makes it easy to load the tanks and spray them. This application is also great for furniture, cabinets, bulky equipment or small equipment. It is like our paint wall, but with an “awning” of lights and some side walls to contain the over-spray. 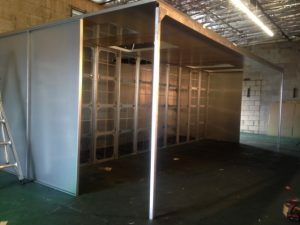 Our open face booths come in a variety of widths to fit every application! Whether you’re painting furniture, parts and pieces or tanks… we have a booth for that. Give us a call with any questions at 888-312-7488. Thanks for sharing the photos Cramer Decker… enjoy your new booth from Standard Tools and Equipment. Previous Previous post: Standard Tools and Equipment Celebrates 20 Years.